Yttrium is a chemical element wi seembol Y an atomic nummer 39. It is a sillery-metallic transeetion metal chemically seemilar tae the lanthanides an it haes eften been clessifee'd as a "rare yird element". Yttrium is almaist always foond combined wi the lanthanides in rare yird minerals an is never foond in naiture as a free element. Its anly stable isotope, 89Y, is an aa its anly naiturally occurrin isotope. In 1787, Carl Axel Arrhenius foond a new mineral near Ytterby in Swaden an named it ytterbite, efter the veelage. Johan Gadolin discovered yttrium's oxide in Arrhenius' sample in 1789, an Anders Gustaf Ekeberg named the new oxide yttria. 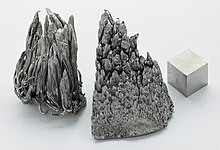 Elemental yttrium wis first isolated in 1828 bi Friedrich Wöhler.